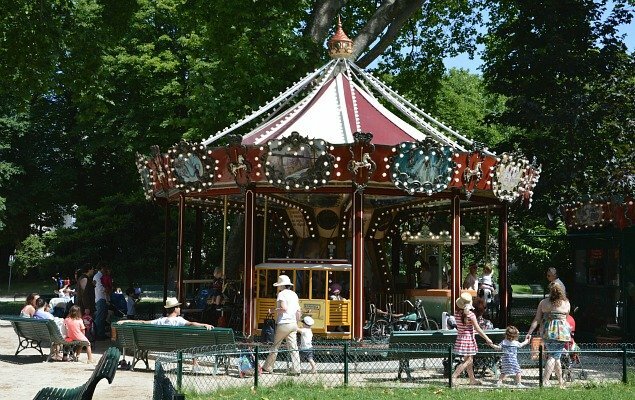 Enchanting carousels, like this one in Parc Monceau, are found in parks throughout Paris. 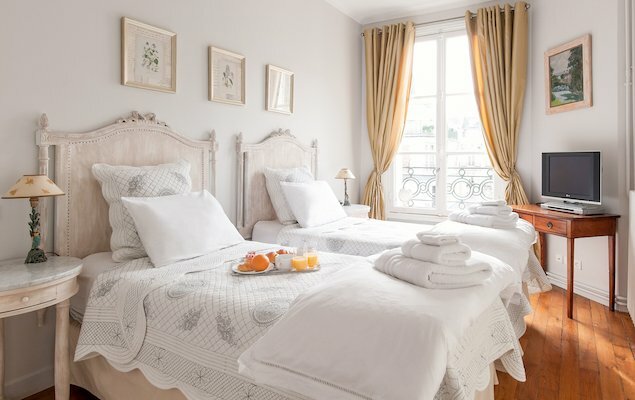 When you think of Paris, it might not scream family-friendly vacation. But that’s a popular misconception that couldn’t be further from the truth. Paris isn’t just a place for lovers, but it’s also a great place for kids of all ages. The city is full of attractions and tours that cater to families, as well as beautiful green spaces and impressive monuments. Here are five kid-friendly ideas to make your family trip to Paris perfect. 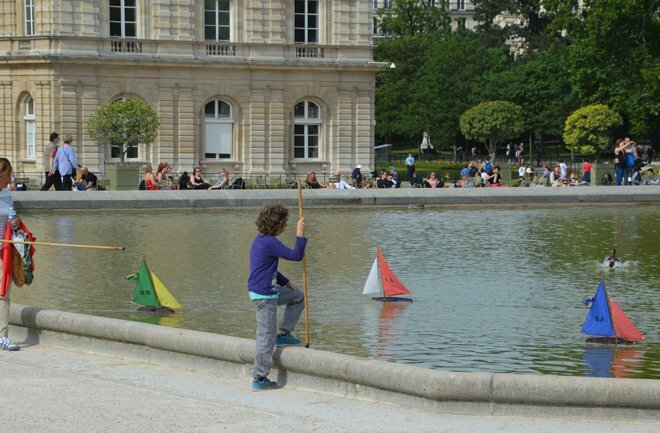 Children playing with rented sailboats at the Jardin du Luxembourg. This park and well-known garden is a great place for both kids and parents. Kids can enjoy a large playground, puppet shows and pony rides. 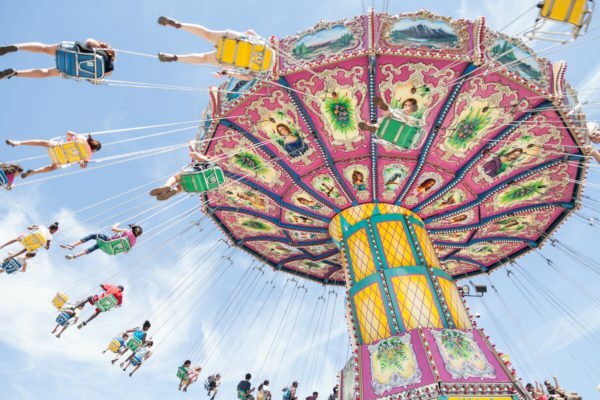 Take the kids for a ride on a vintage carousel that dates back to 1879. The green-roofed merry-go-round, which was sketched by the same man who created the Opera House in Paris, Charles Garnier, is a hot spot for kids. Consider renting a remote-controlled boat. For a few bucks you and your family can zip model boats around the pond in the park. Luxembourg Palace, which sits at the heart of the 55-acre park, is also a must-see. It was built as a home for Marie de’ Medici, the widow of King Henry IV. However, she was banished before building was complete. It now houses the French Senate. Kid-friendly Segway Tour in Paris. Image provided by City Segway Tours. There are lots of places to see in Paris with your family, but you don’t have to walk to them all. Why not see Paris on a Segway? Your kids will love driving their own motorized Segway to check out hot spots in Paris. Scoot by the Louvre, hop off your Segway and snap pictures of the Eiffel Tower and take in the sights and sounds of Paris without tiring your feet. 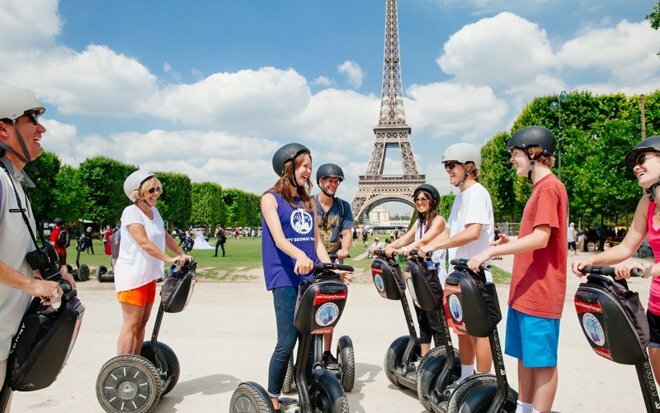 You can book a three-hour day Segway tour, or a two-hour night Segway tour that showcases the City of Lights in a unique and entertaining way that is ideal for older kids. The Palais de la Decouverte. Image by Panaramos. 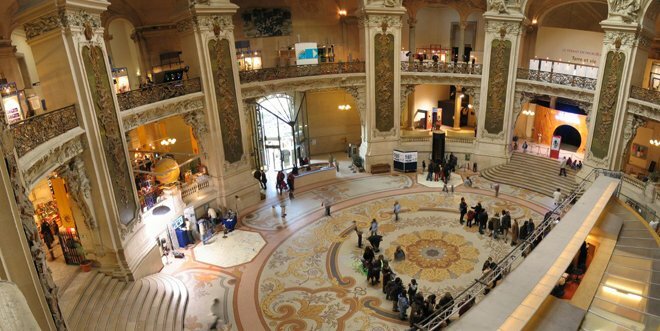 Palais de le Decouverte, which translates to Palace of Discovery, is a fun and interactive science museum that’s geared toward kids. You’ll find interactive games, workshops and a planetarium that can’t be matched. Under a 50-foot dome, the starry sky of Paris is projected for everyone to see. Stop in for a 45-mintue show that offers an introduction to astronomy and points out the constellations that kids can look for that night on their own. The building itself is steeped in history. Jean Baptist Perrin, who won the Nobel Prize for physics in 1926, came up with the vision for this museum in the 30s. With a glass and iron roof, this two-story stone structure is picture-worthy itself. Louvre Crash Course for Families. Image by Context Travel. The Louvre is a great educational opportunity for every family, but the entire museum covers the equivalent of 15 acres. Where do you start? How do you keep little ones interested long enough to see the best exhibits? 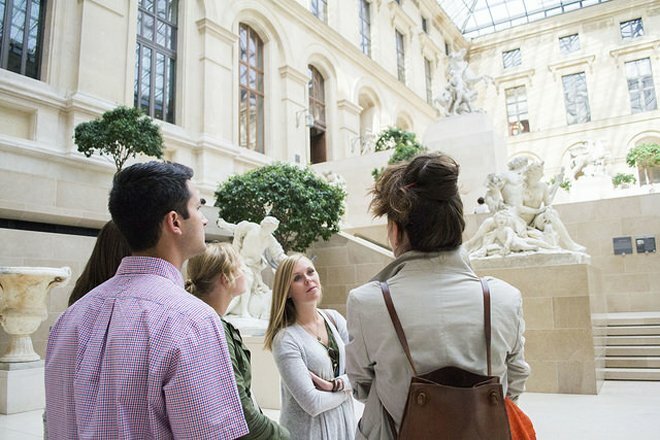 The Louvre Crash Course Tour is your answer. You get to pick a themed tour. You can choose between kings and queens, gods and goddesses, and heroes and heroines. This 2.5-hour guided tour is designed with children in mind, with stories and tales that keep their interest. Tours run everyday, except Tuesdays. La Menagerie du Jardin des Plantes. Image by Marco. Ready for an animal adventure? Check out the La Menagerie du Jardin des Plantes. This zoo and botanical garden opened in 1794, making it one of the oldest in the world. 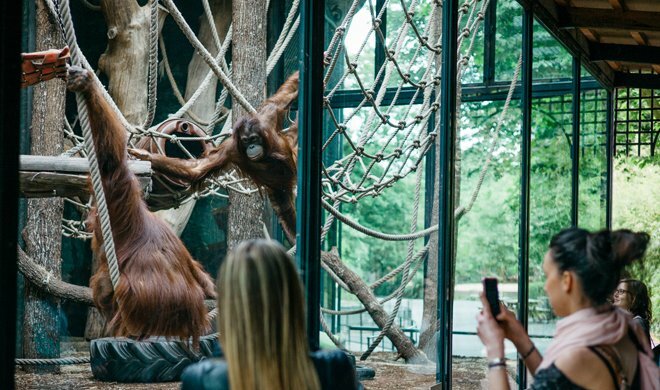 With 1,200 animals hanging out in the heart of Paris, it’s a kid-favorite. One third of the animals in the zoo are threatened species like red pandas, snow leopards and white-necked cranes. Take a walk through the park on your own, or go for a guided tour. Kids can check out interactive educational exhibits and use microscopes to see the tiniest of organisms. With so many great sites and tours, Paris should definitely top your list of family-friendly vacation spots. There are so many options; you won’t have any problem filling your days with events and attractions that your entire family will love. For more ideas, check out our kid-friendly travel guide for Paris. NEXT: A Rustic Pear Galette That’s Super Easy to Make! Posted on Monday, October 19th, 2015 at 3:28 pm in See & Do. You can follow any responses to this entry through the RSS 2.0 feed. You can leave a response, or trackback from your own site.